Refinishing Great-grandmother’s Oak Rocker - Schoenbauer Furniture Service, Inc.
A: Because most of the old finish is gone, preserving the old finish isn’t really an option. Whatever finish remains should be removed so that you wind up with a new finish that’s uniform. To tighten the loose joints, the chair will need to be at least partially disassembled, using spreader clamps or a wooden or rubber mallet. Then the existing glue needs to be scraped out, new glue applied and everything clamped tightly until the glue dries. Antique chairs are often held together with hide glue, which has fallen out of favor because it’s not as strong as modern PVA (or polyvinyl acetate) white and yellow woodworking glues, which create a bond that’s stronger than wood. But repairing a chair made with hide glue is a lot easier because it softens readily with heat or warm water and so is easy to remove. And when it fails, joints loosen but the wood itself does not rip apart, as it can with the more tenacious glues. When he restores chairs, David Hawksford, owner of Colonial Restoration Studio in Gaithersburg (301-948-6652; colonialrestorationstudio.com), matches the new glue to the type that he scrapes out of the joints. For most antique chairs, that means hide glue; for more modern ones, yellow glue. To repair broken parts other than joints, he often uses two-part epoxy. 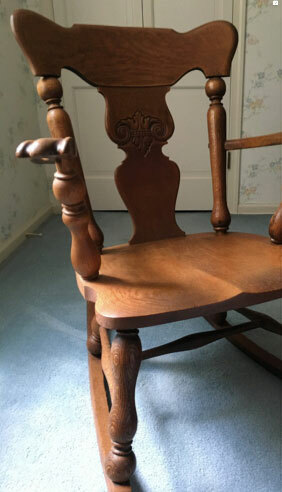 A reader would like to refinish this oak rocker. Depending on how much finish is left on your chair, he might use a chemical stripper, applied by brush, never by dipping. The finish would depend on what look you want. His guess is that the original finish was shellac or an early lacquer. The modern equivalent would be sprayed-on lacquer, which would produce a durable, easy-to-care-for finish. But if you wanted an oil finish, he could do that instead. Hawksford estimated the total cost at $250 to $350. Katie Schoenbauer Morgan of Schoenbauer Furniture Service (800-955-7603; schoenbauer.com) in Charlotte Hall, Md., estimated $350, which would include a golden oak stain to achieve the original look and several coats of varnish. This company picks up and delivers throughout the Washington area for an additional charge. Several other shops quoted separate prices for regluing and refinishing, which might be useful if you want to leave the tricky disassembly and regluing to a pro but tackle the finishing steps yourself. Corey Powers, owner of American Hardwoods (301-588-0363, americanhardwoodsinc.net) in Silver Spring, estimated the gluing would cost $200 and refinishing about $400. Bob Johnson, owner of RJ Johnson Furniture Restoration (301-625-5744; rjjohnsonfurniturerestoration.com) in Silver Spring, estimated $235 for gluing and $375-$400 for refinishing. When customers want to apply finish themselves, he recommends Minwax polyurethane in a satin finish so brushstrokes don’t show. When he applies the finish, he sprays lacquer.